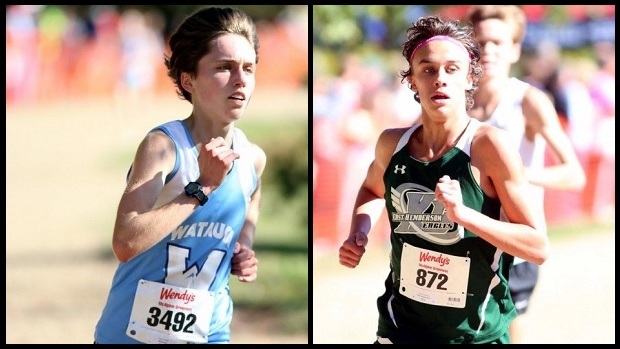 Teams go to the Wendy's Invitational for two things: top-notch competition, and PR-caliber times. The 2014 edition of the meet did not disappoint, as the weather was nearly perfect and a large amount of talent was on disply throughout the morning (and into the early afternoon). At the end of the day, the peformances from this meet had turned the previous rankings on their ear, so it's a good thing we're going to publish some Classification Team Rankings this week! 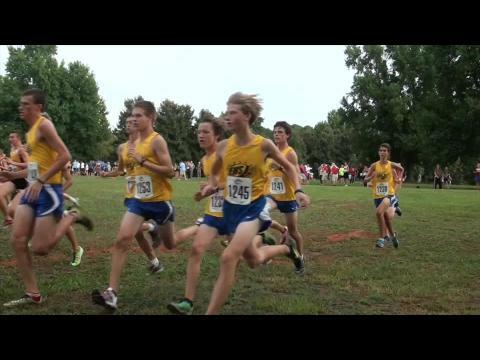 The pace was set early by Tanis Baldwin (East Henderson) and Kyle Christ (West Johnston) and they pulled the lead pack through the mile; that group held Myers McKinney (Spartanburg, SC), Davis Stockwell (Lakeside HS, GA), Dean Abushouk (Cary), and Mitchell Resor (Weddington). As the runners emerged from the woods and rounded the lake for the first time, Baldwin and Christ began to pull away and were battling for the top spot. Resor, Abushouk and Stockwell chased in a second pack that also began to gap the rest of the field. As they made their way around the lake to the two mile marker, Baldwin took off from Christ, knowing he was close to breaking 15. Following, McKinney had taken over the pace for the second group as all entered the last mile essentially neck and neck. Baldwin hit the closing lake loop in total command of the race, as all that was on his mind was time. He was able to roll down the homestrech and finish footsteps away from sub 15, as he ran a new PR of 15:02. Christ was able to hold onto second running 15:28, proving himself amongst the top ranks of 4A runners. McKinney hammered through the last mile to finish third in 15:34, as juniors Resor and Stockwell came in right behind in 4th and 5th respectively, each running big PRs of 15:37. Some runners not mentioned that had huge last miles after conservative starts were Matt Bomkamp of Northwest Guilford, and Kenny Kneisel of Mount Tabor, as both moved up into the top 10 each earning new PRs of 15:42 and 15:46 respectively. 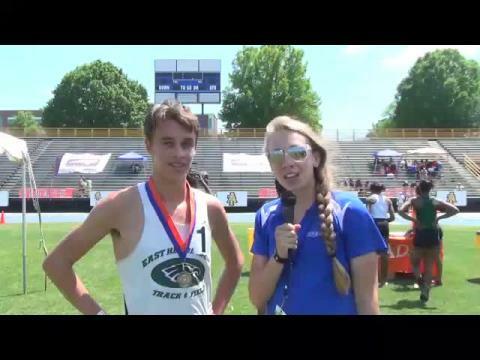 Team-wise, Weddington had a great meet as Mitchell Resor proved that he will be a low stick for them at the state meet; the junior continues to emerge as a star. Team tactics were in effect as Weddington's 2-5 runners ran as a pack through the begining of the race, and they finished within 12 seconds of each other running 16:09-16:20. The Warriors are still hungry for much more as they look to repeat as 3A State Champions. Chapel Hill had a near perfect day as nearly their whole top 5 runners ran their PR, leaving the Tigers only 25 points off from 3A rival Weddington. They also look to be podium contenders for the 3A State Meet as they look to knock off current favorites Cardinal Gibbons and Weddington. It wasn't the most ideal of days for East Chapel Hill and Mount Tabor, who were both looking for the team title, but still a lot of postives for both. East Chapel Hill's top five were all near their season's bests. As for Mt. Tabor, Kenny Kneisel had a fantastic day, but a rough start held many of the Spartans back from their best; still, when the whole team performs to their capabliities they could be knocking on the door at the 4A state meet. Watauga's Kathleen Mansure was certainly ready to break through the 18 minute barrier after running 18:00 last weekend on a difficult course. She had a commanding lead throughout the race, beginning with her initial sprint off the starting line. Trailing Mansure were Mary Prouty (Myers Park), Lily Anderson (TC Roberson), and Kingsley Green (Etowah, GA), followed by a trio of sophomores from Riverside (SC): Cate Ambrose, Ashley Fallow, and Abigail Smith. Mansure continued to push herself though the hill as no one was within contention to challenge her. Prouty and Anderson had broken away from the chase pack, trying to reel in Mansure and hoping she would come back. Moving up into the top ten was Ardrey Kell's Kiley Aymar, who had tucked herself into the group of Riverside girls. As they rounded the lake, Prouty began to gap Anderson, and she had her sights set on catching up to Mansure who was now in sight on the open loop. After conservatice starts, teammates Maysa Araba and Helen Morken (Carboro) had made up many spots through the hill part of the course and now ran with Aymar, as they had passed the Riverside girls. Mansure had her eye on the clock down the final stretch, finishing the race in a new PR of 17:32, which will really put her name out there as a contender for a Footlocker Nationals qualifying spot. Prouty was able to finish strong also, smashing the 18 minute barrier as she finished in 17:49. Anderson came in third and was able to hold off girls who were surging late behind her; she ran 18:14. Kiley Aymar rolled down the homestretch as her closing speed was able to put her in 4th place with a new PR of 18:20. Green ran an even pace throughout the race, then held off Araba for fifth place as they finished in 18:23 and 18:24, respectively. Riverside was in command of the team race from the get-go, as their top three runners finished 7-8-9, the young squad proving to be too much for anyone else to handle. Chapel Hill's girls had a fantastic day with a 34 second 1-5 spread, which is always a great thing to have. They look to have some fantastic races against conference foe Cardinal Gibbons, as the two are currently ranked 1-2 in the 3A rankings. Myers Park finished third and took down regional foes TC Roberson as both teams had good overall days. 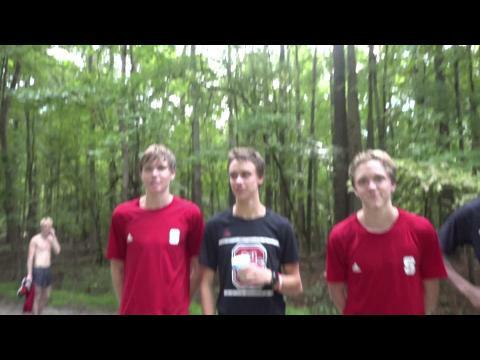 The race was taken out by Dartanian Oakley (Hardin Valley, TN), Ben Gilman (Hilton Head, SC), and Jake Blizzard (Marvin Ridge), who all had their eyes set on fast times. As the runners made their way to the lake, Oakley and Gilman began to pull away, and the pair would duel as they rounded the course. Trailing was Robert Anderson (Pinecrest), who had worked his way toward the front as he went up the hill. As they went through the last mile, Oakley was able to outlast Gilman as he was able to take the win in 15:46. He continues the streak of Hardin Valley having an individual win in the Open Race at Wendy's to five years! Gilman was able to hold of late surging John Green (West Forsyth,GA) and Anderson, who all dipped under the 16 minute barrier. Hilton Head, despite not quite having the finish predicted by the Virtual Meet, were still able to come out victorious by placing three runners inside the top 10. Pinecrest was the top North Carolina team as they were able to finish second by just 15 points. The Pinecrest team looks to be just one runner short of being a top team as they placed four runners under 16:30. Lake Norman's boys were able to finish in fourth, but had two runners in the JV race that would have scored in their top 5 today, which would have put them relatively close to Pinecrest. Grace Sullivan (Providence) and Alexa King (Marvin Ridge) took the pace out strong as both had fast times on their minds. Sullivan and King ran stride for stride through the first half of the race. Sullivan began to take sole possession of first place in the second mile, through the hill section of the course. Trailling Sullivan and King were Liz Galarza (West Forsyth, GA), Natalie Andrejchak (JM Robinson) and Paige McKinney (Hough). Sullivan was able to leave the competition in the dust as she pulled away from King running 17:53. Galarza was able to make up a lot of ground and finished strong as she was able to catch King and finish second in 18:16, over a minute PR! King faded to third in 18:25, but she will certainly be back at McAlpine with a sub-18 time before long. Andrejchak and McKinney battled all the way to the line, but Andrejchak was just able to outlean McKinney as both finished in 18:49 in 4th and 5th respecitvely. The virtual meet predicted an extremely close team race, as the top four teams were projected to score within five points of each other. Providence ran without their usual #3 runner, but that didn't seem to hold them back whatsoever. Providence was still able to place 5 runners in the top 20 and have their whole top seven run under 20 minutes, to run away with the team title as they won by a large margin. Marvin Ridge came in second, but still only had five runners finish the race, so when all runners are healthy and running well the Mavericks should be a lot closer to Providence. 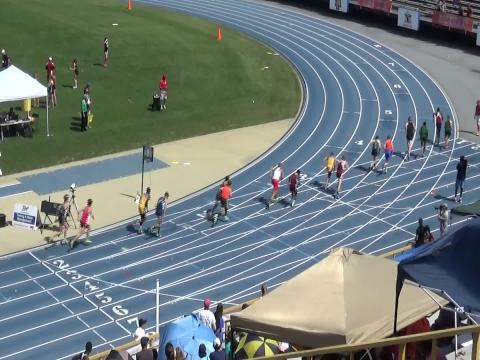 Eastside (SC) and Hilton Head (SC) finished third and fourth, as both teams ran well on their trip north to Charlotte. We knew Zach Boone of Mitchell was going to go after a blazing fast time; the question was whether anyone would go with him, and the answer turned out to be yes. Hickory Ridge's Alex Cornwell went right with Boone as the gun went off and wasn't going to let Boone run away with the individual title. 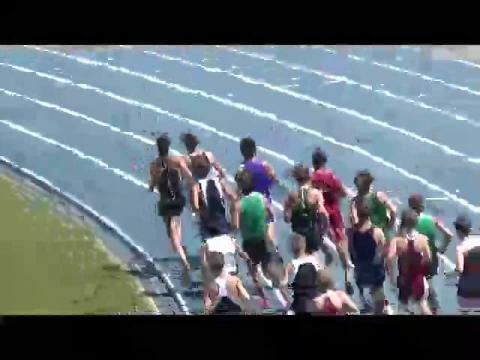 Trailing Boone and Cornwell was Jesse Carson's Zach Marchinko and Cliff Conley of Galex (VA). Cornwell was able to stay right with Boone, who was trying to pull away, until around the two mile mark. Boone was able to open up some space while Cornwell was doing everything he could to not let him get out of reach. Boone threw the hammer down over the last mile to run a new PR of 15:31. Cornwell didn't fall too far behind as the Junior finished second in 15:40, which is a PR for him as well. Conley and Marchinko battled side by side throughout the race, but Conley's closing speed was too much for Marchinko; the pair finished third and fouth as both finished under 16, 15:55 and 15:59. The team battle between Westminster (GA) and defending champs North Lincoln ended in a tie each scoring 113 points. With Westminster having the faster 6th runner they were awarded the team championship. North Lincoln overall had a great day despite the tiebreak loss. They have a solid top 5 group of runners that vary in place each meet. If all of their runners have a good day they could be a team to place well at the 3A State Meet. 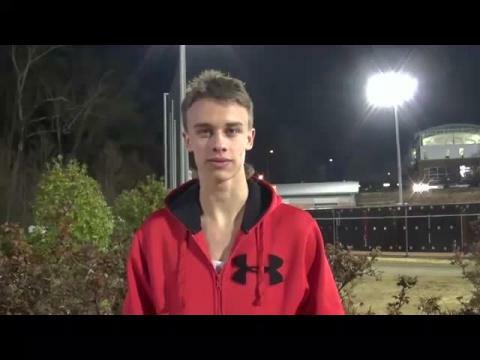 Jesse Carson was able to outscore confrence rival Hickory Ridge, as the two prepare to square off once again at the SPC Confrence Meet in a couple of weeks. Both could be teams that advance out of the 3A Midwest Regional to the State Meet. Prerace favorites Anna Vess (AC Reynolds) and Brittany Stanley (Mt. Pleasant) went right to the front with Emma Hand (Northwest Cabarrus) trailing. The two remained in a deadlock throughout the race until they reached the last mile. Vess was able to close strong as she was able to pull away from Stanley. The two didn't finish as fast as they were hoping, but still ran 18:39 and 18:47. Audra Yarber (Abingdon High School, VA) was able to finish in third as she ran 19:04. Freshman Jaeden Phelix (Piedmont) outkicked Kayla Ste. Marie (Corinth Holders) as they finished side by side, both given a time of 19:14. Alexia Noch (Cuthbertson) had her best race of the season, as she finished right behind Phelix and Ste. Marie in 6th with a 19:15. AC Reynolds was the champion in this division as they were led by overall first place finisher Anna Vess, and also had all seven runners finish before any other team had 5. The Rockets averaged 20:00 for their 1-5 runners. Weddington was able to take down regional foe North Lincoln by 20 points and Asheville by 22. Asheville was just one runner shy of competing with Weddington for second overall. Cuthburtson finished in fifth but did not have their best day against county rival Weddington.